Jeb Bush can’t even spell marriage – but he has still come out in defence of an anti-gay Kentucky clerk who was jailed for contempt of court. The Republican politician – the brother of former President George W Bush and son of former President George H W Bush – is currently trailing Donald Trump in the bid for the Republican Presidential nomination. In a collection of emails Mr Bush released last month, the former Governor of Florida told a gay constituent that his partnership “shouldn’t be afforded” the protections of “marraige” [sic] – consistently misspelling the word marriage while espousing his ‘belief’ in traditional marriage. 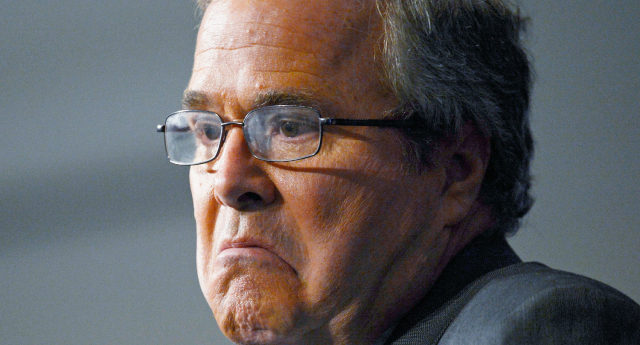 Ever the fan of “marraige”, Mr Bush has come out swinging this week in defence of Kentucky’s Kim Davis – who was jailed from contempt of course after she flouted direct court orders, and continued to discriminate against gay couples seeking to marry. Speaking out after Ms Davis, the clerk in Rowan County, Kentucky, rejected a deal that could have seen her released from prison, Mr Bush claimed she should be accomadated by the state. He said: “[Davis] is sworn to uphold the law and it seems to me there ought to be common ground.